Armando Frazao Calado, 84, died Tuesday, September 18, 2018. Born in Portugal he lived in Newark for 34 years before moving to North Arlington 10 years ago. He was the beloved husband of America Diogo Calado, the devoted father of Vilma Dacruz, Elizabete Aigner, Fatima Molon, Cidalia Simi and Armando Calado Jr., the cherished grandfather of 10 grandchildren and 2 great-grandchildren. 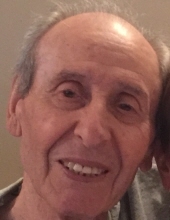 Relatives and friends are invited to attend Armando’s Funeral Mass on Saturday, September 22nd at 11 a.m. in Our Lady Queen of Peace Church, North Arlington. To send flowers or a remembrance gift to the family of Armando Frazao Calado, please visit our Tribute Store. "Email Address" would like to share the life celebration of Armando Frazao Calado. Click on the "link" to go to share a favorite memory or leave a condolence message for the family.